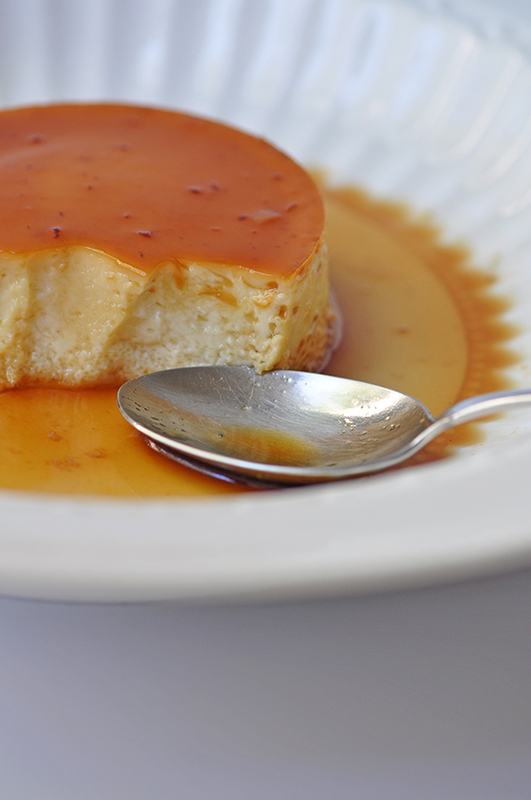 In this month’s Kulinarya Cooking Club, we feature Leche Flan. This popular Philippine dessert has its origins from the flan from Spain. Melted sugar is poured over a ramekin or pudding container and allowed to caramelize. Then over this, a custard mixture of milk, eggs, egg yolks and sugar (and a hint of flavouring like lemon, lime or vanilla) is poured. The leche flan is then steamed on the stove top or baked in a bain marie. Once done, instructions require the dessert to be cooled (usually a few hours) and then turned over on a plate. To me, the most nerve wrecking moment is when I flip the leche flan dish over a plate – I hold my breath thinking, will the leche flan have set? Will it break in half? Or will it fall out in one piece? Will it come out smooth and creamy? While there is a family recipe for leche flan, I thought it might be interesting to try something different and so instead of my Mum’s recipe I used a recipe from Pichet Ong’s The Sweet Spot. It was a recipe for Coconut Palm Sugar Flan which I had been eyeing for sometime. So off I went to make it and even if baked the flan ten minutes less than what the recipe called for, I still managed to over-baked the flan and it didn’t come out smooth and creamy as I had hoped. The addition of coconut milk however was interesting and I may try to tweak the recipe in the future. Put the palm sugar, lemon juice, and 1/4 cup water into a small saucepan, set over medium high heat, and cook, stirring to dissolve the sugar if necessary until the mixture becomes dark brown and registers 175 c on a candy thermometer, about 12 minutes. Remove from the heat and stir in 1/4 teaspoon salt. Carefully divide the caramel among twelve 115 grams ramekins. Put the milk, coconut milk, coconut, sugar and the remaining 1/2 teaspoon salt into a medium saucepan, set over medium heat and warm, stirring occasionally, until bubbles begin to form around the edges. Remove from the heat and let steep for 30 minutes. Add the evaporated milk to the coconut mixture. Whisk the eggs and egg yolks in a large mixing bowl until the yolks are broken, then add the milk mixture in a slow, steady stream, whisking constantly. Strain the mixture through a fine-mesh sieve into a bowl, pressing on the coconut to extract as much liquid as possible. Set the mixture in a larger bowl filled with ice and chill completely until cold. Divide the coconut mixture among the prepared ramekins and put in a deep baking dish. Carefully pour enough water into the pan, without spilling any into the ramekins, to reach halfway up the ramekins. Bake until the flan is just set, about 45 minutes (I baked this for only 35) – the sides should be firm but the center still quite jiggly. Cool completely in the pan. Serve the flan once it has cooled, or for even better results, cover and refrigerate for at least 4 hours. Invert the flan onto serving plates. If the flan seems stuck, run a thin bladed knife around the edges of each ramekin, and then invert. Sprinkle each with fleur de sel if desired. I swear I could eat flan every day! I don’t know why, but I’m now getting the Kulinarya emails. Where do I go again, Trissa? Love all the ingredients used in this recipe. I am sure it still tastes good even if it’s a little over done. I remember my mother telling me custards and flans will not have a silky texture if you use too much sugar. And I also put a paper towel under the dish in the bain marie. I often substitute coconut milk for regular milk in a coconut bread recipe and it always turns out fine. Caramelize the sugar and line bottom and sides of your pan with it. Beat egg white until frothy and mix them into remaining ingredients. Pour into mold and bake in a pan of water 350 for 45 to 50 minutes. Chill 6 hours minimum. Turn out when ready to serve. Serve cold. Trissa, your flan looks very beautiful. All the ingredients you used for this dessert were my favourites! I’d really like to try it one day. I love coconut milk in leche flan. I’ve also tried it once and also added pandan extract. I loved the taste. You had a great idea to also add shredded coconut. Oh wow the flan looks beautiful! I love flan but have never tried making it at home. This recipe is definitely a keeper! Yum!!! I would love to make one of these some day soon. I think I may have made one when I was in high school…. can’t remember though..
Looks delicious! I really want to stick that spoon in my mouth. Yummo! This looks fabulous Trissa. I’ve just been checking out Asha’s flan and both look equally impressive. I have never even made my own flan and I do love it! I am not particularly fond of caramel and especially making it sort of scares me everytime but I’ve got to try one of these very soon. Adding coconut to it sound brilliant to me! haha.. I had that moment too trying to invert the flan, which was.. well.. stuck in my case coz I had overdone the caramel :)) But fortunately, it came out in one piece! i’ve always been a bit wary of flan–there’s something about the jiggly consistency that reminds me of jello nightmares of my childhood. this looks completely appealing though–that gorgeous sauce and the use of coconut and coconut milk are quite enticing! oh..I love coconut, now why didn’t I think of this? I will try this next time for sure.. it looks so yummy and I can almost imagine how good it taste.. This looks lovely! And I would always prefer coconut milk to diary milk or cream any time. I even make pana cotta with coconut milk! trissa this looks delectable! i adore flans! trissa, i love coconut things…specially in dessert…yeah, i agree about the taking out the egg whites…it makes the flan more fragile. I so love coconut flan!! MMMMMM,…your version looks so tempting too! Nice Trissa! Absolutely stunning!!! Like everyone here, love the addition of coconut milk – it gives a different depth to it and makes it more Pinoy by taste and tradition! Hurray for another great Kulinarya theme! Your flan looks fantastic. I usually don’t have much luck in the baking delicate desserts department but looking at your photos I’m very tempted to give it a try. Btw, I have been following your blog for awhile but this is my first comment. I really enjoy your blog and your stories are great. I have made a variation of leche flan using coconut milk before but found the flavor weak. I like that yours used dried coconut also. I also like the use of salt to cut down on sweetness, I will have to try this recipe. But you mentioned this was not as smooth and creamy as you’d like. Hmmm, maybe get rid of egg whites altogether since since they tend to give a hard, scrambled egg texture and use heavy cream instead of milk to make it creamier (or maybe even condensed milk but then you have to reduce the sugar). Now you got me thinking of making experiments of my own! Love it! 🙂 Great choice for KCC btw. When I think of flan, I think back to the times I spent with my cousins in Vietnam 10 years ago – those were sweet memories indeed. I will give this a try one day.. Sounds very lovely! This dessert softens my heart. We make this every year for New Year’s Eve. If not New Year’s Eve, we make them anytime in December. Trissa, this looks divine. Out of interest do they taste very different to Creme Caramel? omg kath’s, and trisha’s just made me salivate. looking at yours doesnt make my starving tummy feel any better! I felt the same way when I flipped it over… hahaha! It was fun though… i enjoyed dressing it up to cover the flaws haha! yours look great and perfect! creamy and silky… yum! It looks wonderful to me and, as much as I love the rich sweetness of condensed milk, coconut milk sounds like a delicious change. After seeing some of the other KCC members’ flans, I have a serious craving for it now! Trissa OMG it looks great. I would eat that right now. I like how you used coconut milk to make it different. I have to try this recipe. Its easy to over cook Leche Flan. But like with everything practice makes perfect. I’m sure it was still delicious. 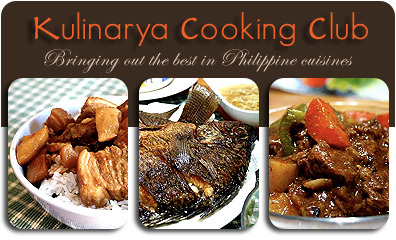 I wud like to join Kulinarya cooking club.Please let me know the details. This is such a swell idea – keeping traditional dishes alive. I think your flan looks fantastic! It’s smooth, creamy and wobbly … and most importantly, WHOLE. 😉 Oh, and coconut milk seals the deal for me! It’s gorgeous Trissa! 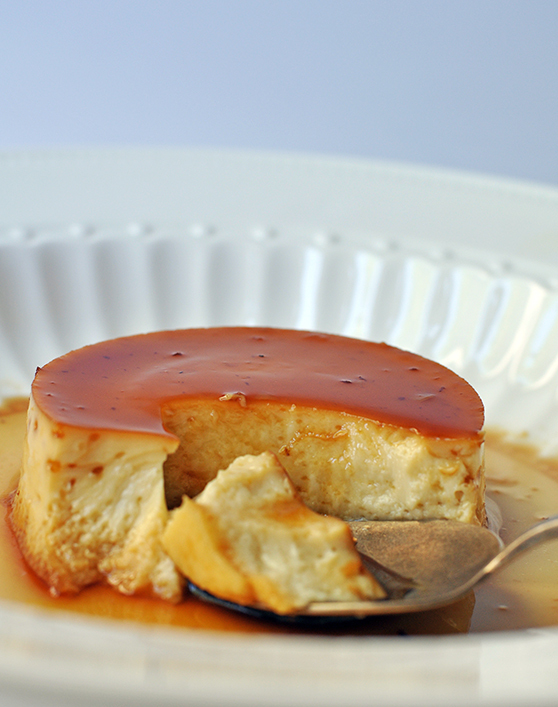 I need to try a flan, and this one looks fantastic =D.